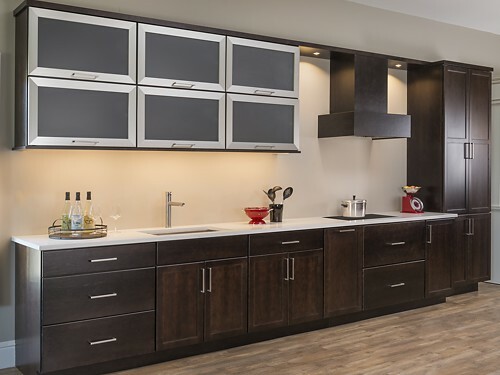 The "Morgan" kitchen has a modern theme featuring a dark, rich finish on the cabinets and complementing brushed aluminum top-hinge doors. A sleek, contemporary wood hood hangs prominently as a focal point. Stop by the showroom to examine the inverted, shallow pantry that displays the semi-custom features the Schrock Trademark line has to offer.